We invite proposals from educators, academics, education officers, industry partners, graduate and undergraduate students for papers, poster presentations, panels, workshops, symposia, and innovative showcases. Proposals will be peer reviewed. The submission reviews are now complete, authors will be notified no later than Friday, February 28 of the final decision. You must create a use ID through the conference software in order to begin the submission process. You will be prompted to login/create a user ID to start the submission process, and ensure you select all three options for your account type: Reader, Author, Reviewer. All submissions must be received in Microsoft Word or pdf file using the online submission system. All the documents must use Times New Roman font (11 or 12 point), 2-cm margins (all margins), with consecutive page numbering, as shown on the Paper Submission Template. The online submission must be completed and submitted by December 9, 2013 (23.59 GMT) in order to be considered for the Conference. No late submissions will be considered. All of the submissions can be either individual or co-authored. On making a submission to the conference, authors are required to check off items on the Submission Preparation Checklist. All submissions have to be in grammatically correct English and proofread carefully before uploading. Submissions that do not meet academic standards for educational research will not be considered for review. Note that submissions may not have been previously published, nor submitted before another conference for consideration. The submission file is in Microsoft Word or PDF file format. The length of the submission must comply with the submission requirements detailed in the “Submission Process”. Conference organizers will NOT accept any submission that does not meet these requirements. All acronyms are explained and the use of acronyms is minimized. The text is single-spaced; must use a 11 or 12-point Times New Roman font; 2-cm margins all around; employs italics, rather than underlining (except with URL addresses); and all illustrations, figures, and tables are placed within the text at the appropriate points, rather than at the end. For the presentations that require hands-on participation, on-site resources and requirements are outlined. All submissions are peer reviewed. Criteria include the quality of the proposal, the relevance to the Conference themes, significance of research questions or issues, appropriateness of the research methodology and analysis, the importance of the findings, and the overall logic and clarity of the conclusions and implications of the research. For Workshops and Innovative Showcase presentations, the audience engagement will be paramount. Relevance and significance to the STEM field and Conference audience, as well as expected impact for STEM 2014 participants will be given priority consideration. 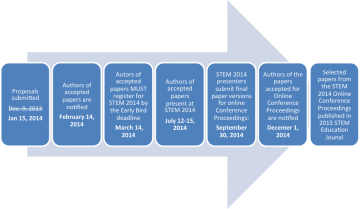 All authors who submit a proposal for STEM 2014 Conference will be expected to serve as reviewers for other proposals. Presenting authors of accepted papers AND all participants in accepted panels, symposia, workshops and innovative showcases are expected to attend and register for the STEM 2014 Conference before the Early Bird deadline on March 14, 2014. All registered STEM participants will have access to the papers published in the STEM 2014 online proceedings. They will be available on the Presentations webpage page in December 2014. Not all proposals accepted for presentation at the conference will be published. After the conference in July, we will post an announcement to all authors of the deadline to submit final papers (September 30, 2014). The committee will assess the quality of the papers to determine eligibility for publishing by December 1, 2014.